Geographical distribution The tractor markets of Karnataka, Maharashtra, Tamil Nadu, and Gujarat are growing ~ 50%. Market Capitalization CAGR in volumes @ 10 % over past four decades with seasonal variations. Indian Tractor Industry developed in 1945 to 1960 because of the War surplus tractors and bulldozers were imported for land reclamation and cultivation in mid 1940's. In 1947 Central and State Tractor Organizations were set up to develop and promote the supply and use of tractors in agriculture and up to 1960, the demand was met entirely through imports. In 1951 there were 8,500 tractors in use, 20,000 in 1955 and 37,000 by 1960. Local production began with five manufacturers in 1961 producing a total of 880 units per year. Eicher, Gujarat Tractors, TAFE, Escorts, M&M are the major tractor manufacturers. During 1965 this had increased to over 5000 units per year and the total in use had risen to over 52000. In the year 1970 annual production had exceeded 20000 units with over 146000 units working in the country. From 1971 to 1980 six new manufacturers were well established during this period although three companies (Kirloskar Tractors, Harsha Tractors and Pittie Tractors) did not survive. Escorts Ltd began local manufacture of Ford tractors in 1971 in collaboration with Ford, UK. Others were HMT and PTL (SWARAJ) Total production climbed steadily to 33000 in 1975 reaching 71000 by 1980.
Credit facilities for farmers continued to improve and the tractor market expanded rapidly with the total in use passing the half million mark by 1980. 1981 to 1990 A further five (Auto Tractors, Haryana Tractors, United Auto Tractors, Asian Tractors, VST Tillers) manufacturers began production during this period but only last one survived in the increasingly competitive market place. Annual production exceeded 75000 units by 1985 and reached 140000 in 1990 when the total in use was about 1.2 million. Then India - a net importer up to the mid-seventies - became an exporter in the 80's mainly to countries in Africa between 1991 to 1997. Since 1992 it has not been necessary to obtain an industrial license for tractor manufacture in India. By 1997 annual production exceeded 255000 units and the national tractor park had passed the two million mark. India has now emerged as one of the world leaders in wheeled tractor production. Saturation achieved in Punjab with tractor density as high as 82 per 1000 ha against Indian average of 12.4, world average of 17.4 and 32.1 in developed countries. Intense competition has led to rapid advances in design and quality. Tractors are an integral part of mechanization and have a crucial role to play in increasing agricultural productivity. By advancement in manufacturing of tractors there's possibility that could lead India to another green revolution. In 1961 since tractor manufacturing in India started, the industry has grown at a phenomenal pace in the last five decades to achieve a record production of over three lakh units per year. In Farm Mechanization there are two major contribution one higher productivity and greater output. Tractors form an integral part of the farm mechanization and have a crucial role to play in increasing agricultural productivity. Tractor is a highly versatile piece of machinery having a multitude of uses, used in agriculture both for land reclamation and for carrying out various crop cultivation and also employed for carrying out various operations connected with raising the crops by attaching suitable implements and to provide the necessary energy for performing various crop production operations involved in the production of agricultural crops specially in India where the major occupation is Agricultrue. Tractors are capital intensive, labour displaying used as a mode of transport, in electricity generation, in construction industry and for haulage operation. It has now become an integral part of farm structure .The problems of farmers has been erased by the application of tractor for agricultural activities which swept India during the last twenty years . 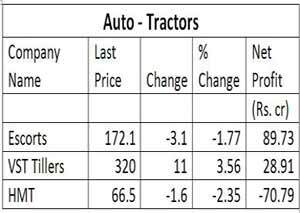 Indian Tractor Industry, comparatively young by world standards has expanded at a spectacular pace during the last four decades. 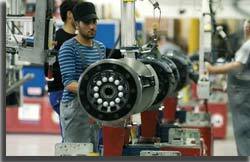 Consequently it now occupies a place of pride in India's Automobile Industry also. U.S.A., U.S.S.R. and only a few Western European countries exceed the current production of tractors. India's growth is unmatched even with countries of long history of Tractor manufacturing. The Indian Tractor Industry's spectacular achievement reflects the maturity and dynamism of tractor manufacturers and the various policies adopted by the government to enable it to effectively meet the demand. It is a typical industry where both imported technology and indigenous developed technology have developed towards meeting the overall national requirements of the country. As per the global spotlight on tractors manufacturers in terms of volume seems to be swinging away from the USA, UK and Western and Eastern Europe towards India where growth in the number of producers and the total volume in recent years have been impressive. In India, Tractor Industry has played a vital role in the development. According to a study conducted by PHD Chamber of Commerce and Industry, since purchase of tractor involves a big investment its demand is affected by the availability and easiness of credit. A higher availability of credit will lead to a higher demand for tractors. The tractors between the 31-40 horse power and 31-40 hp range dominate the market .The reason for medium horse power tractors being more popular are that the major tractor demanding states like Punjab, Haryana and Uttar Pradesh have plenty of alluvial soil which does not require deep tilling. Lately it is visualised that higher hp segment has the maximum growth potential. Higher horse powered tractors will be the future requirement with the government intention to encourage contract farming through the leasing in and leasing out of farm lands. Tractor market in India is about Rs 6000 crore. On an average around 400000 tractors are produced and their sale is 260000. 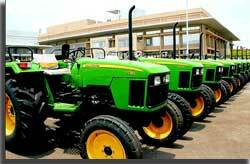 Uttar Pradesh is the largest tractor market in our country. One out of every four tractor is being purchased here. One third of world's Tractor production is in India. The Total Turn Over is 10000 crore and the Total investment is 8000 crore. With Employment of 28000 people directly and 150000 people indirectly the Tractor population is 3000000 compared to 900000 in China. Regarding exports India has been exporting tractors to a number of countries, but predominantly to Srilanka ,Nepal and U.S.A However study reveals that exports from India are going down in the recent years .The major reason for the decline in exports of tractors from India is being the failure to find an extensive market overseas, deteriorating foreign exchange situation in African countries and their poor buying capacity, comparatively cheaper imports of second hand tractors by South East Asian countries from developed countries and the disintegration of erstwhile U.S.S.R but also the potential export markets can be explored by India in the future. Since Indian tractors has the international standards by virtue of their foreign collaboration it is possible for India to export to more tractors to the rice and wheat growing countries like Canada, Philippines and Bangladesh. Today in India there is an increase in awareness among the farmers for the need of farm mechanization and are keen to acquire tractor with the help of credit facilities from financial institutions. Agronomists believe that there is need for more tilling due to depletion of moisture and repeated cultivation of land .It is precisely for this reason that the demand for tractors was well maintained even during a drought period. Cost of tractors in India is the cheapest in world .The cost of a finished tractor here is as much as the cost of gear box in developed countries. Hence there exists tremendous scope for exports. Animal power available is too inadequate to meet power demand of our farmers. Mechanized operations are preferred to eliminate drudgery and delay, also labour shortage during harvesting increased the use of tractor. 95% of tractor sales are on credit. Credit is extended by commercial banks, state land development banks and regional rural banks. Irrigation facilities reduce reliance on the monsoon and allow for quick yielding varieties of food grain .This reduces the cropping cycle to 3-4 months from the traditional 5-6 months. Reduced cropping cycle require deep tilling which translates into higher demand for tractors.